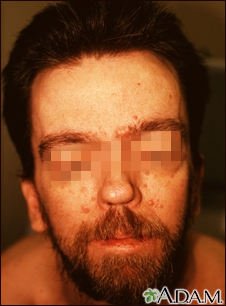 The basal cell nevus syndrome has associated with it odontogenic cysts of the jaws, pitted depressions of the hands and feet (tiny basal cells), and osseous anomalies of the skeleton. Care is given by removal of the carcinomata on a regular basis and genetic counseling, since this is an autosomal dominatly inherited disorder. Reviewed By: Kevin Berman, MD, PhD, Atlanta Center for Dermatologic Disease, Atlanta, GA. Review provided by VeriMed Healthcare Network. Also reviewed by David Zieve, MD, MHA, Medical Director, Brenda Conaway, Editorial Director, and the A.D.A.M. Editorial team.